Remember when Consumer Reports failed to recommend the Apple iPhone 4 shortly after its launch on AT&T? As we reported, the impartial testing organization refused to rate the device because of the infamous "Antennagate" problems that was taking signal strength down on the handset when it was held in a certain manner called "the death grip". The new CDMA version of the iPhone 4 has a different antenna configuration due to the CDMA radio. Still, Consumer Reports has found that the Verizon version of the phone still suffers from dropped signal bars and poor reception. Paul Reynolds of Consumer Reports wrote on the non-profit organization's blog and said, "The Verizon iPhone 4 closely resembles the original AT&T iPhone 4 in many positive respects, including offering great multimedia functionality, a sharp screen, and the best MP3 player we've seen on a phone." Reynolds added, "Unfortunately, it also shares with its sibling the possibility of compromised performance in low-signal conditions when used without a bumper or case." Ironically, Verizon's Chief Technical Officer David Small had told CNN at the time of the original Consumer Reports story that the antenna problems on the AT&T iPhone 4 would never have passed Verizon's testing. Small said, "We have a very stringent design criteria for our antennas. You won't see any antenna issues with this device." Even though Consumer Reports will not recommend the Apple iPhone 4, it did give the handset a score of "Excellent" for its display, browsing, navigation, battery life and multimedia. Phoning and messaging were rated "Very Good" and voice quality was given a "Good" ranking. This must of hurt phonearena.com to report this since they love their iPhones soooooooooooo much. ( . ) ( . ) > CR reports. Old news. This was out days ago. I believe they also rated the Lg Env touch a high rating, which was probably Verizon's most buggy phone in the last couple of years. Wait? Y THUMBS DOWN? its the same as the other one that got thumbs up! o wait... because maybe its 'iphony' nostalgia is starting to wear off. when the 'new' iphone comes out of corse its gonna get a good grade bc the hype... but now that its not 'new' they really looked at it for what its worth. just another mind controlling POS from apple. funny, have you ever had one? because i own one and love it. I actually respect Consumers Report a lot on most issues, but Electronics in general, and the mobile industry especially, moves so fast that C.R. recommendations seem near dated by the time the issue hits the stand. iPhone sales won't see a hiccup of difference from this report. But, it does seem that more and more negative press is coming apples way. Will be interesting to see the new devices and how they are recieved this summer. Like their comments or not, they are a non profit who has been around longer than any of us. They don't need and don't allow advertising, so it's funny how their views draw so much ire when it's not something you agree with. To think that CR is going to cause people to return their phones is stupid. But the problem is verified and real, and millions who don't follow tech closely won't buy products unless they are CR test and recommended. Like it or not, they are a huge power player in ratings. And they got this one right. Actually, I will buy that argument. Most non tech savvy people do depend on publications like C.R. for their research, which is better then not researching at all. That is how I found Phone Arena, trying to make an informed decision on something I was completley lost on. I know cars, appliances and other large purchases get bumps in their sales when J.D. 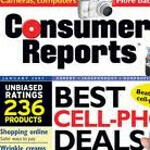 Powers and Consumer Reports speak well of them, so cell phones probably are not much different. Iphones are different though. Its such a strong attractive brand to the consumer they dont care. It would be like if a new Nintendo game system had disc reading errors if you held your controller a certain way.. People would still rave about Nintendo and buy 'em like Hotcakes. You guys need to stop arguing bout the Iphone 4. IT'S APPLE FAULT ON THEIR DESIGN not AT_T or Verizon.